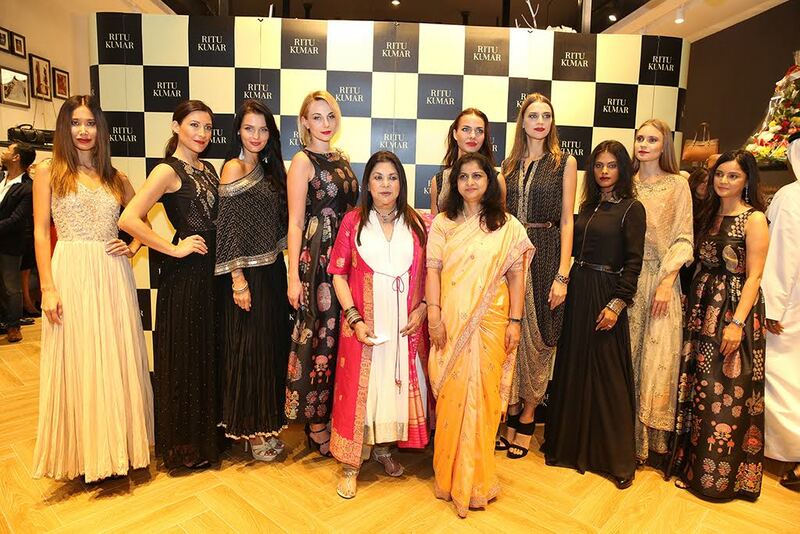 Dubai: Ritu Kumar, India’s leading design house, has opened a new store in Dubai Festival City mall. The outlet, was officially inaugurated by H.E. Ms Neeta Bhushan Charge d’Affaires Indian Embassy and H.E. Mr Anurag Bhushan, the Consul General of India in the presence of the celebrated designer Ritu Kumar along with many dignitaries and VIPs who gathered to view the designer’s latest AW2016 collection. In attendance was the corporate team led by CEO Amrish Kumar, as well as local hosts and franchisees of the brand – Sure Fashions owned by Mrs Nirja Shah and Mr Jinesh Jain. The evening commenced with a fashion show highlighting a mix of luxury and high-street looks from Ritu Kumar and Label Ritu Kumar lines. Spread over 1600 sq ft in Dubai Festival City mall with a spectacular triple height shop-front the new store is the brand’s second outlet in the emirate having begun operations in the UAE with a flagship store at BurJuman Centre in January, 2014. Ritu Kumar design house offers three brands: Ri, a premium bridal and couture line, Ritu Kumar, a traditional brand offering ethnic semi-formal wear and LABEL Ritu Kumar a contemporary pret line. Speaking at the inauguration, Mrs Ritu Kumar, said, “We are delighted to announce our second store in Dubai. In addition to being a very mature market itself, Dubai is perfectly located for tapping the neighbouring markets. It is a highly cosmopolitan city and gives us the exposure we need to access new customers in the country and in the region”. Mrs Kumar added, “The Middle East offers exciting growth prospects and has many cultural similarities to India’s. Therefore, we believe that we have a unique product positioning for the region and are well placed to tap it. We are hoping to expand to 7-10 stores over the next 4 years or so and looking to gain customers who have not been exposed to our brand as yet. Additionally, we expect to start supplying our collections to some local boutiques as we get more established”.